This morning, Mayor Bill de Blasio’s administration released the 1.5ºC plan – a far-reaching new plan intended to align New York City with the principles established during the 2016 Paris Climate Agreement. “In the Trump era, cities have to lead the way when it comes to fighting climate change,” Mayor de Blasio stated in the plan’s announcement. The 1.5ºC plan – a name drawn from the Paris Agreement’s goal of limiting global warming to a 1.5º Celsius increase – is focused on six areas of action: recycling, waste, buildings, energy, transportation, and carbon neutrality. The plan marks the latest development in a series of commitments made by the city to reduce emissions. 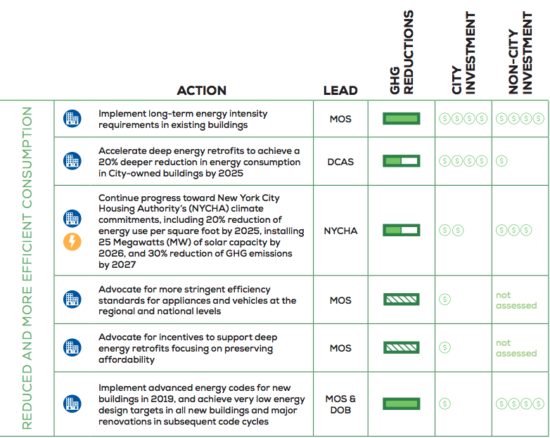 Last fall, the administration released the 80 X 50 Roadmap, which outlined a commitment to reduce the city’s greenhouse gas emissions by 80 percent by 2050. 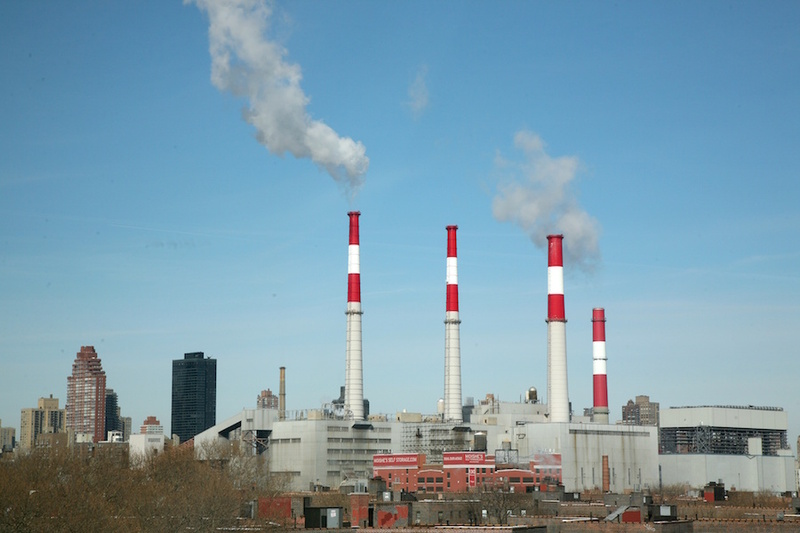 Earlier this summer, Mayor de Blasio signed an executive order opposing President Trump’s intention to withdraw from the Paris Agreement and outlining the City’s commitment to upholding it. At the beginning of September, the de Blasio administration released a plan to update the aging infrastructure of existing buildings over 25,000 square feet by 2030, with strict penalties enacted afterward for those who don’t comply. 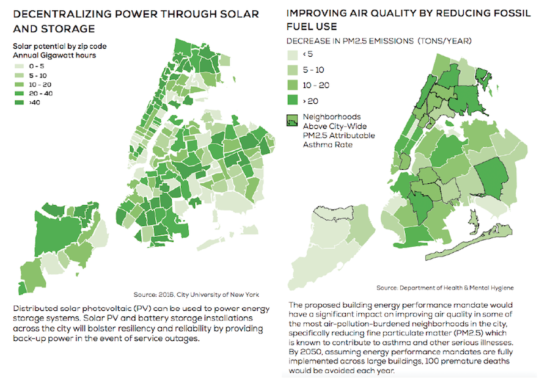 As the 1.5ºC plan states, the administration will apply emissions requirements to new construction and renovations across the five boroughs, and “adopt ‘stretch’ versions of the energy code in 2019 and 2022.” “Stretch” here refers to leniency toward the developers’ approaches – the City will reportedly provide metrics on energy efficiency but not stipulate how developers should meet those targets. As with earlier plans, the city will use Property Assessed Clean Energy (PACE) financing programs adapted for commercial and residential buildings, allowing utility upgrades to be paid off through property bills rather than out-of-pocket. Enacting 100 percent renewable energy in city government operations and buildings is another key aspect of the plan. 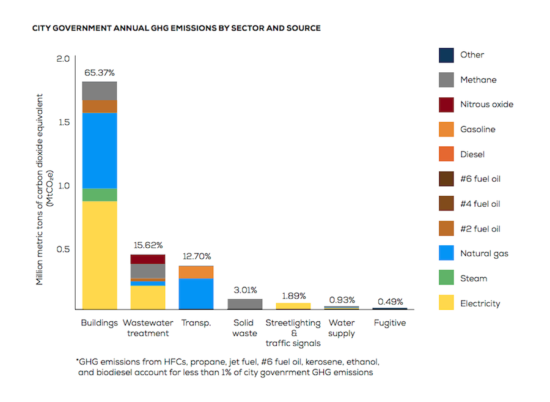 The emissions of city agencies alone account for eight percent of the city’s total greenhouse gas emissions from electric appliances, and 1.5ºC aims to replace all energy infrastructure used by the city with renewable alternatives. Their timeline for this? “As soon as sufficient supply can be brought online.” In the near future, the City has stated their intention to commence 50 new solar projects on public buildings sometime this fall, which would bring it a quarter of the way towards its goal. With regard to the transportation sector, the plan reiterates a proposal Mayor de Blasio made in early August to create a tax on millionaires generating up to $800 million in funds to upgrade the NYC subway system. It also includes a proposal to expand infrastructure for bicycles (including protected lanes) and electric vehicles (including charging stations). Notably, the plan also outlines a goal of establishing a carbon neutrality protocol in partnership with other cities around the world including C40 – a network of 90 international cities already committed to climate leadership – meant to establish common definitions for the reduction of global warming and greenhouse gas emissions. In a public statement about the plan, New York Transportation Commissioner Polly Trottenberg stated that with New Yorkers’ heavy use of mass transit, bicycles, and walking, “New York City produces the fewest greenhouse gas emissions per capita of any U.S. city.” A statistic like this should be used as a baseline rather than a benchmark. As the 1.5ºC plan evolves, hopefully the administration will release more specifics on the methodology they intend to apply to new developments to modernize energy use citywide, and clarify whether any penalties will be applied for those who don’t comply. This morning’s announcement has probably piqued the ears of a number of developers who may be wondering the same.